Andrea bugs me to go on an adventure every Friday and I passed on a few Fridays but I thought it would be cool for her and Brian to go hiking. 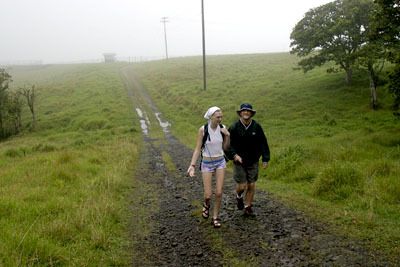 Today it was a day for hiking in Waimea. Here Andrea and Brian start out on the White Road hike. It was a windy, rainy, foggy, cloudy day but once we got into the rainforest we were shielded from the wind and only had to deal with mud, rain and landslides. A perfect day for hiking. Andrea and Brian in a bamboo grove along the trail. 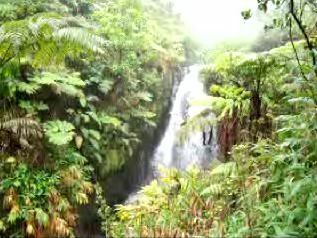 The trail goes to the eastern wall of Waipio Valley near the back end and goes through ginger and bamboo groves, water flumes, ohia trees, tunnels and lava tubes. Brian and myself coming out of a lava tube, or maybe a man-made cave on the side of the trail. Really cool place. A gallery of images from the White Road hike. Whew, finally got that done and posted. Click on the image above for some video Brian shot on the hike. I had to compress it so it’s a bit jerky.